Come 13th of April will be the day to Stand Up for Kids and Protect Our Schools. “Stand up for Kids” is a campaign for parents, families, teachers and other educators who all want the best for our children. It was initiated by NZEI Te Riu Roa, the professional institute and union of 50,000 primary and early childhood educators around New Zealand. We know that to be the best, teachers and schools need parents and whanau as partners and to be fully supported by their communities. So this campaign is not just for teachers. It’s for anyone interested in the future of our children and the future of our quality public education system. 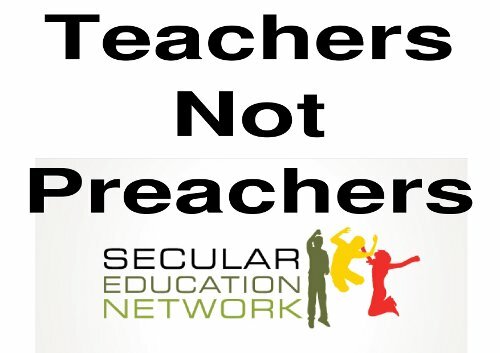 This is a campaign and a “Day of Action” that supporters of the Secular Education Network need to get involved with. NZEI National Office has been contacted and they are more than happy to see our SEN campaign represented as part of this action. All SEN supporters who are able should take the time on Saturday the 13th of April to get involved with one of the many planned events around the country. For those of you in Auckland, we want to put together a group to march in the Queen St event. SEN is organising professional placards to promote our specific concerns and are also contacting various media representatives to ensure that our message receives coverage from them as well. List of Events around the Country. Auckland Event Details – Gather in Queen Elizabeth Square (Bottom of Queen St) from 11.00am, march up Queen St at 11.30am, arrive at Aotea Square for rally at approximately 12.15pm. Wellington Event Details – Gather at the Cenotaph at 12:00pm, March to Parliament. As Sean Faircloth said to us, I challenge you to get involved and make a difference! The reason the “Religious Right” exerts so much influence in politics, is because they show up! Saturday the 13th is a rare opportunity to display our concern for the current excellent NZ secular state education system and the pupils within it, while also giving us national exposure to highlight the specific issues that the Secular Education Network has been trying so hard to raise awareness of over the last couple of years. Personally, I’ll march on my own, holding an SEN placard, but I would much rather march within a larger group of SEN supporters who are willing to show up with me. So, will you?